Sometimes I wonder how much of our "right now" the boys will remember. The first distinct memories I have are of my kindergarten years. I still remember my teacher, the boy I had a crush on (in kindergarten!! ), and who I played with on the playground. PS. Bright colors for fall get a big yes from me! This yellow sweater will be getting a lot of wear over these next few months. I remember kindergarten building blocks and nap time ... I also remember being very upset that we didn't get nap time anymore once I started the first grade haha! Oh the memories :) ... I have a yellow scarf I've worn a couple times this Fall and I've gotten many compliments on it. I think yellow is a great power color! I love your boots. I was looking at a similar pair a couple weeks ago but they just weren't in the budget ... oh well! 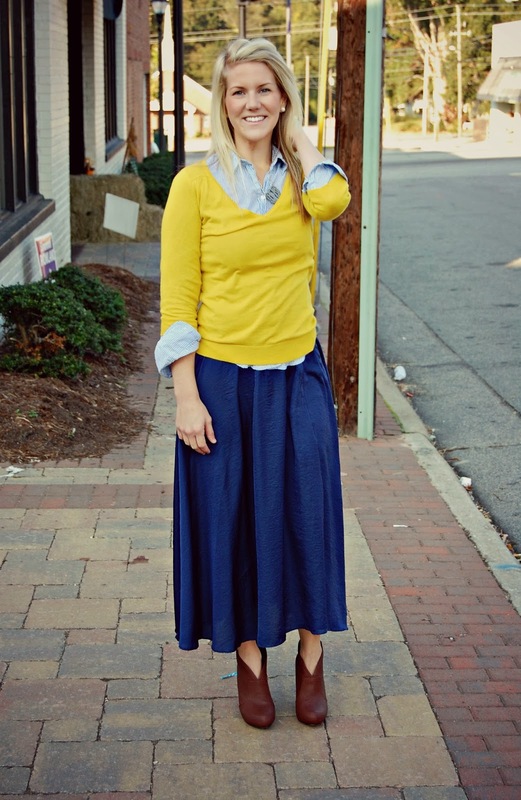 Your cheery yellow sweater is great for the gloomy days of October! I have a lot of memories from when I was in nursery school, so I definitely think your boys will remember certain moments from this age! I am DYING, that is hilarious. I love remembering random, and funny moments from our childhoods. You are so stinking gorgeous ma'am, would've LOVED to have edited these this week! You know I'm in LOVE with that yellow sweater!! I didn't realize until I read you saying you remember your kindergarten crush that I remember mine too. And why did we have crushes in kindergarten?! Ha, that means Charlie will have a small crush in not too long ;) p.s.-- Don't get too excited but I found some booties similar to yours. Phew ;) I'm pretty excited! is your hair getting lighter? it looks really blonde and beautiful in these pics! I love it. A lot of people go darker in the winter months but I always want to go lighter for some reason. I think most of my distinct memories began around kindergarten age too, but it's amazing how snippets of memories come back from before then too when my mom or dad reminds me! 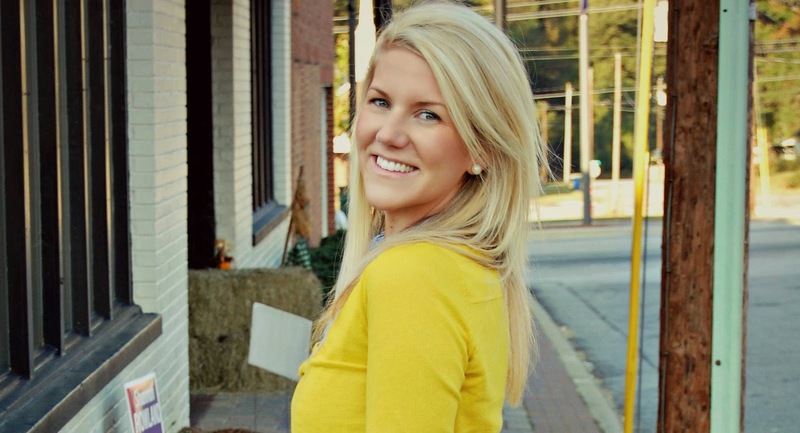 Love this bright yellow sweater! It looks so great against the blue skirt! My memory has gotten worse over time, which makes me so sad! My childhood years were the best, so I hope to cherish those memories forever. On another note, I love the yellow & blue together. Haha! My brother told me random stuff like that and I totally believed him too. Ah, good times. I remember Kindergarten and that I used to follow a little boy around and sit next to him at every reading period. It's strange the things I remember too, Like, I only remember certain things from when Nick was a baby (he's 10 now!) and the one thing I remember most was how I used to give him a bath in the middle of summer, we would snuggle up in the cool AC and watch Elmo's World. It's quite possibly my favorite memory. I have vague memories of a family vacation from when I was about 6...besides that not very much. Some people seem to be able to remember much younger than others. My husband likes to tell people he can remember being born and that it was a very unpleasant experience just to freak people out (it's a lie). i love your shoes! and such a cute outfit! i have a few memories from kindergarten at school - but I don't think many before that. that is what pictures are for right? oh i love this! this made me think about being in kindergarden and then memories I have! So funny about your stomach growling. i thought that oero's icing was made out of whale fat when a kid told me that! I hate that I can't remember much about my childhood, I have a terrible memory. Hahaha omg those are definitely the worst moments in class ... I'm a pro at shuffling papers really loudly when I know my stomach's about to growl! I love the combination of bold punches of color! What great pictures of you!!! Can you mail me those boots, please? Oh man, I had more boyfriends in kindergarten than the rest of my life. I totally peaked early. Haha...I wish others couldn't hear your stomach growl...I hate that. I love that yellow! Great color on you. You are just looking radiant in your pictures lately, lady! Love this color combo, btw. Love this look, Ashley! The colors are so fun. You look great! Such a cute outfit! Love the yellow! I definitely have a lot of memories from when I was younger. and I love your booties soooo much. i need a pair like those! What a cute little story :) I hate when people hear my stomach growl...so awkward! You look so pretty Ashley...love those colors together! haha that is the cutest story! i love kids!! My stomach used to growl so loud every day in the quietest class in 7th grade :). Love the booties with the skirt! Hilarious about the stomach growling theory! My earliest memory is from learning how to tie my shoe at my preschool, Mary Poppins, during nap time on those little cots we had to sleep on. I shouted out "I've got it" during nap time and got in trouble! I barely remember my years in Kindergarten, but I remember my third grade crush. 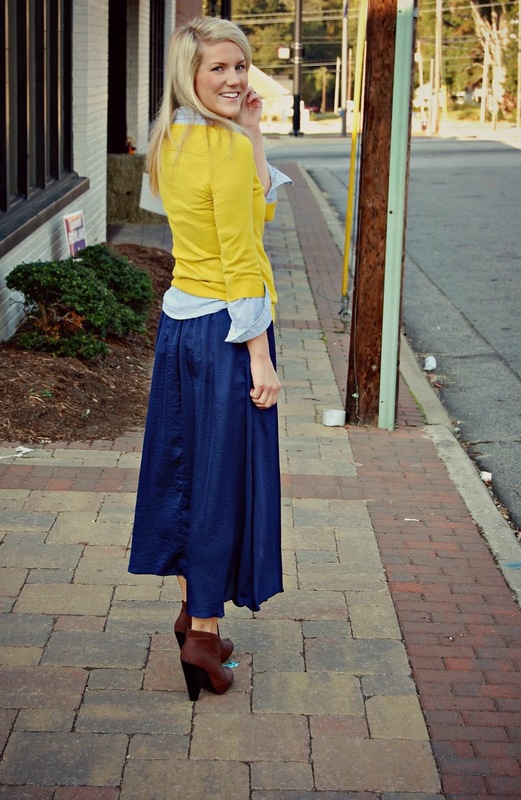 Super cute outfit, I love the blue midi skirt and also the bright sweater. Just gorgeous... you that outfit... it's just plane gorgeous! You are so pretty Ashley! I love the yellow sweater. beautiful color for fall.